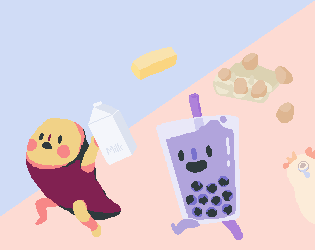 YAM AND BOBA GET SOME GROCERIES. What is this? A puzzle game, but also a fighting game, but also a game within a game??? Either way, you need to get those groceries!!!! Very important groceries! To my friends, the real life sweet potato and boba, a very happy 20th! Many thanks to cottontrek for all his glorious help.